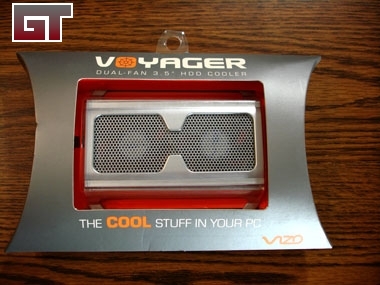 Today we're looking at a product called the Voyager � no, not the TV show, nor the satellite - this little guy from Vizo is designed for a less glamorous but equally important job: keeping your hard drive cool. As we move to faster, larger, hotter drives, coolers like this become more and more important if we want to protect our data. The Voyager comes in a nice small package that protects the cooler while eschewing any tacky designs for a clear view of what you're buying. As I was un-packaging the cooler, I noticed that they didn't use the typical yellow-black-red wire for the Molex connector; instead, they've utilized a clear wire. The cooler also comes with six screws in a tiny plastic bag. Let's take a look at the cooler from all sides. I noticed that the only part of the frame that isn't aluminum is the top. It's made of plastic and holds a fan grill. However, it is painted or dyed perfectly to match the aluminum, and isn't a real disadvantage. On the two ends you can see the company logo and the name of the cooler. 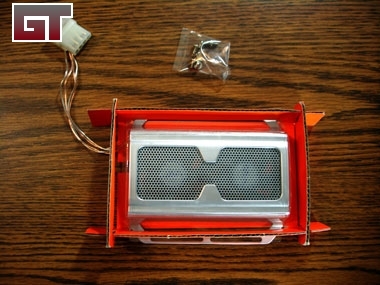 The bottom is made of aluminum and has six holes for the clips that retain the top plastic piece. Additionally, you can see the rails to attach it to the hard drive. 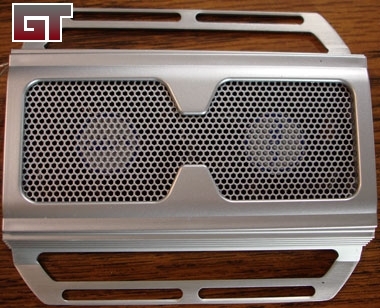 The clips are useful; they make it very easy to remove the top of the voyager to clean the fans and fan grill. We all know how dusty the insides of computers can get! The pieces, thankfully, fit back together as simply as they come apart. 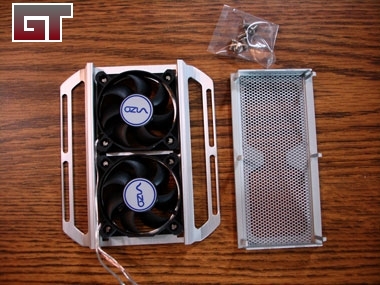 Both of the fans are 50x10mm and run at a quite quiet 20dBA. 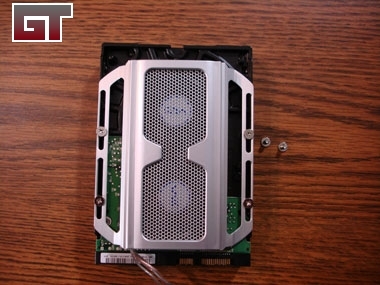 The cooler covers most of the drive and mounts using the bottom screw holes on your hard drive. 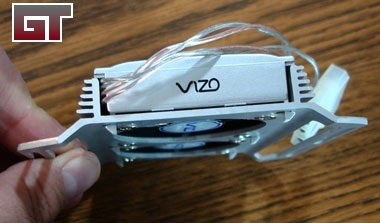 It's also obvious that Vizo has thought about what would look good in a computer with a window. This certainly looks better than black plastic and a circuit board. This hard drive cooler is not one of the extreme models that surround the drive in aluminum or use thermal pads to aid in heat transfer. The Voyager blows air over the electronics, keeping them cool, although my laser thermometer only showed a difference of 1-2 degrees with the cooler installed. The noise level of the fans, however, is negligible, and can't be heard over the other fans in the Thermaltake Mozart TX case used for testing. 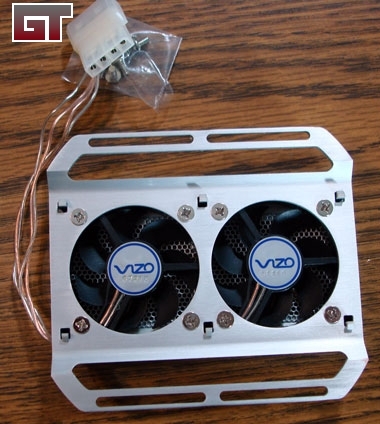 Importantly for modders, this cooler looks good and fits in most cases, a definite positive. Thanks to Vizo for sending us this sample!